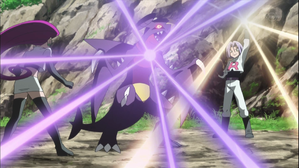 » Episode Guide » Viewing Episode: 狙われたメガシンカ！ガブリアスの絆！！/Mega Evolution is Being Targeted! The Bond with Gablias!! Miare Gym Match! Satoshi VS Citron! !